When a migraine hits you can go from happy to headache faster than you can click your heels three times and say “there’s no place like home”. Despite physicians still not fully understanding migraines, they are thought to be a headache that occurs due to painful inflammation in cranial nerves and the dura mater. They can also be related to rapid expansion of the cranial blood vessels, which can then irritate the cranial nerves. This will give the migraine the common “throbbing” sensation that so many experience with the condition and leave most suffers wishing that a house would merely land on their head instead. A staggering 39 million people in North America suffer from migraines, and a vast majority of those are female. The main reason behind this statistic is both simple and frustrating: hormones. For most women who experience migraines, they typically start with the beginning of their menstrual cycle and end once menopause has occurred. Studies find that menstrual related migraines can cause “significant limitations of daily activities (for example, nausea, vomiting, and photo-phonophobia), and the attacks are generally longer, more severe, and less drug- responsive than non-menstrual ones” (ncbi). If you are someone who has experienced migraines for a long period of time, chances are that you know what your triggers are and how to avoid them. But what do you do when it is something that cannot be avoided? What happens when your migraines are caused by hormones? In instances beyond your control, preventative measures can be your best bet, so what can you do to help yourself? Using a selection of points specific to the type and location of migraine, acupuncture can help relieve the many symptoms without the potential side effects that can come with Western medicines. “Acupuncture has been found to have effects on the nervous system, including locally where the needles are placed…where a ‘damping effect’ occurs on pain transmission…” (migrainetrust.org). Along with helping the pain aspect of the migraines when they are occurring, acupuncture can also assist with the hormonal triggers. Unlike Western medicine which attempts to bring about balance to hormones via an external source (ie. birth control pill) acupuncture needles are used to encourage self-regulation within the body. Individualized treatments are also devised depending when in your cycle the migraines occur, as various hormones rise and fall with the different aspects of the menstrual cycle, menopause, and pregnancy. Changing which treatment would be most effective; treatments will also be adjusted for when during the migraine phase you are coming in. Not all are capable of functioning while in the middle of a migraine, but acupuncture can be used as preventative medicine for between attacks, as well as for its analgesic effects during an attack. Additionally, acupuncture can also assist in reducing the myriad of symptoms that plague migraine sufferers such as: hypertonic muscles, nausea, vomiting, and light sensitivity. Decreasing not only the pain, but also the all-encompassing additional migraine symptoms, means less time spent in bed with the lights off and earplugs in, and more time spent doing what you want. Although less able to assist with hormonal migraines, there are other contributing factors to migraines that massage therapy can help with. Many who suffer from hormonal migraines also suffer from postural ones, meaning that treating only the hormonal aspect may help with most of the triggers and symptoms, but not all. Also, if you know that your migraines are not hormonal, treating them as such will not yield as effective of results. An all too common posture in our society today that increases the chances of experiencing a migraine (and other headaches) is known as a “head-forward” posture. This is becoming more and more prevalent as we spend all day working on a computer, staring forward in our cars, watching television, and fixating on our cell phones. This postural imbalance can cause irritation and inflammation of the C1 and C2 nerve roots, causing them to be an additional aggravating factor in the causation of migraines. Another well-known trigger of migraines is stress. Stress and the forward head posture can equally contribute to hypertension of the neck and upper back muscles, as well as compression of the nerve roots and blood vessels in the cervical and thoracic spine. Same as with Acupuncture, depending on where you are in the migraine cycle (during an attack or between them) will determine the course of your massage treatment. During a migraine a technique called Manual Lymphatic Drainage (MLD) has been proven to help assist with increased cranial pressure when performed on the head and neck, and is light enough in pressure as to not aggravate the migraine further. There are also many additional modalities that a therapist may use to reduce hypertonicity in the surrounding muscles to compliment the MLD. Between migraines therapists can help you to work on bettering your posture by releasing trigger points, increasing range of motion in your neck, and reducing firing of the sympathetic nervous system (a common side effect of stress). Reducing the rate at which the sympathetic nervous system fires and increasing the activity of the parasympathetic nervous system can help you to alleviate stress and decrease blood pressure, both of which can play a major factor in migraines. 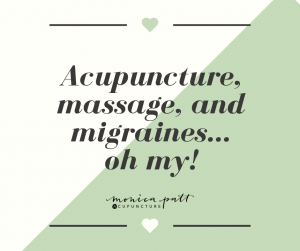 Seeing an Acupuncturist or Massage Therapist for treatment of your migraines is a great start, but what should you do when you are in between treatments? if you are prone to having those pounding migraines that we discussed at the beginning of the blog, before it goes full Wicked Witch of the West on you, try getting your feet into the hottest water you can handle for 5-10 minutes. Simultaneously, put either a cool cloth or an ice pack on the back of your neck. This will draw the blood away from your head and into your extremities as well as constrict the blood vessels in your neck to prevent the blood from rushing back up once you take your feet out of the water. Stretching out those tight muscles in you upper back and neck on a regular basis will prevent them from compressing the blood vessels and nerves in your upper back and neck. It can also cause you to focus on your breathing. Slowing your breathing down is a signal to your parasympathetic nervous system which can help you ease into “rest-and- digest” rather than the “fight-or-flight” stress of the sympathetic nervous system. What you eat affects you in more ways than just fulfilling a hunger need, it can also affect your hormones. Paying attention to the types of food you are ingesting (less starches, more complex grains and cruciferous vegetables), hydrating, and being aware of what food triggers you may have during different the hormonal fluxions of your cycle can help you prevent migraines from occurring. Both massage and acupuncture can be used to alleviate your discomfort during a migraine, or as preventative measures for future migraines. Treatments can be combined or separated, it is all entirely based on what works best for you! So no need to wish you could become the Scarecrow and not have a brain in order to avoid the next migraine. Using acupuncture and massage therapy in a personalized combination of treatments can get you back on your feet and skipping off down the yellow brick road towards a happier, healthier, and less headache-y, tomorrow.